Looking online for extra guidance to master Audio Technology? The world of audio production and music technology moves quickly, and keeping up with the latest techniques, equipment and software can be a challenge. Luckily there are plenty of resources online to help budding engineers and producers wrap their heads around the newest audio tech and how it’s used. This week we present you with a few of the best guides to audio production and music technology from across the length and breadth of the internet. Geared more towards engineers than producers, Graham Cochrane’s blog goes into meticulous depth on equipment and sound dynamics. Particularly useful for anyone trying to set up their own home recording studio. If you’re just starting out in audio production, this should be your first stop for getting a handle on the basics. No prior knowledge is presumed on the part of the reader, and basic concepts are broken down and explained in succinct and accessible terms. As of writing this, they have over 500 articles ranging from guides to specific DAW plug-ins to primers on basic concepts like Voice Compression. Not everything is free, but they definitely err on the side of generosity in what they provide at no cost. A must-read for any self-directed learners. Why Does Yesterday’s Banging Trach Sound Like Crap Today? Plenty of great quality content on here. A particular favourite is his short-but-sweet introduction to compression. Best known as a regular contributor to Freshly Squeezed Samples, Sam Matla’s personal blog is itself a great resource for producers. His posts range from in-depth technical guides to more general overviews of the music industry and how to forge a career as a producer. One of the main reasons to recommend this is blog is that Matla knows how to avoid overloading you with information. (The title of one of his most popular posts “Music Theory: The TL;DR version”, says it all really). Engaging and informative without dumbing down complex topics, Matla’s posts always make for a good read. More of a showcase for Bootsy’s plug-ins than a blog per-say, the quality of his work and the fact that he makes it all available for free is enough to recommend this. With an exceptional array of content covering everything from midi to mastering, Tweakheadz could very easily be your one and only source for all things music production. One of the best things about the site is the way it’s structured. Rather than just random posts on disparate topics, posts are divided into different categories such as music theory, equipment and software. This makes it very easy to structure learning, and for that reason it’s great for people starting out from scratch. Besides being one of the most highly regarded producers in the business, Ian Shepard is also a master of making even the most complex concepts easy to digest for beginners and intermediates. If you’re willing to drop a bit of coin, his ebook “How to Master with Multi-band Compression” is also one of the best primers on multi-band compression out there. 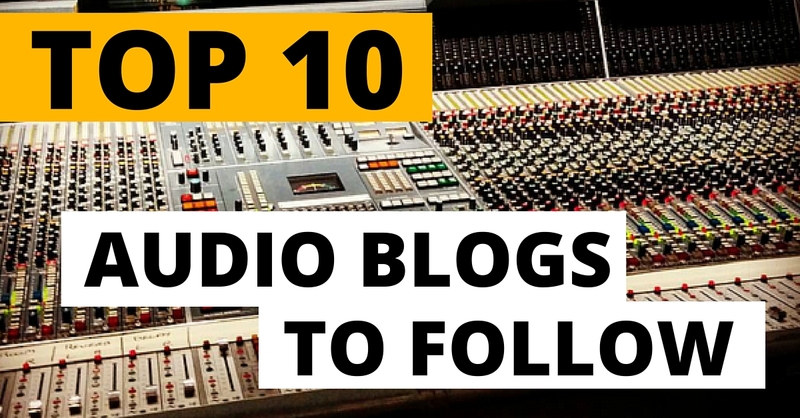 Music Technology Blogs – What have we missed? Of course we’re only scratching the surface with this list, and there are plenty more resources out there to cater to every niche and interest in audio production. If you think we’ve missed anything out then let us know! If you’re interested in getting into the area of Music Technology and Audio Engineering, why not get in touch with us to find out more about our Audio/Music Technology programmes and how they can help you to gain an edge in a competitive industry.